When previewing the report and graph data in Document Composer, you may view the data in simulated or live mode. Note: These preview settings are only available in the Design View of Document Composer and do not affect how data is shown at run time. Previewing simulated data sends a request to the reporting server that gathers formatting information from the Master File. The database is not accessed, but rather, mock data is used to visually represent the report. The formatting and styling options applied to the report are shown when viewing simulated data. Previewing live data sends a request to the reporting server and to the database. This is done in order to get a snapshot of the actual data in the report or graph. You may select the number of records that appear in the report when previewing live data. You may also set the read limit and record limit to control the number of records accessed in the database. In Document Composer, select Options from the Window menu. From the Preview settings option, select Simulated Data. Note: Live Data is selected by default. From the Preview settings option, select Live Data. Use the spin buttons located to the right of the Record limit for reports field to increase or decrease the number of records shown in the report. Position the cursor in the Record limit for reports input box and type a number. Note: The default record limit value for the report is 500. The following options are available from the Developer Studio Options Document tab. Displays a grid. If this is not selected, the grid is turned off for all layouts. Causes objects in the layout to snap to grid lines when being positioned. For detailed positioning, deselect this option. The width of the grid in pixels. The height of the grid in pixels. Previews report and graph data in the Design View. If checked, additional options are available (Simulated Data or Live Data). Note: This option is selected by default. 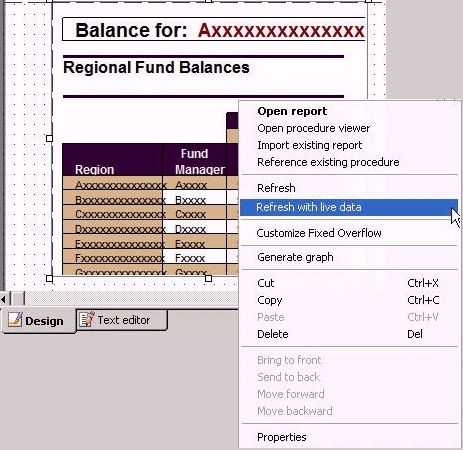 If unchecked, icons are used to represent the area in the Design View for reports and graphs. This is the fastest method of loading reports since no requests are made to the server. Selecting to preview simulated data sends a request to the reporting server that gathers formatting information from the Master File. The database is not accessed, and mock data is used to visually represent the report. Note: This option is only available when previewing reports and graphs. Selecting to preview live data sends a request to the reporting server, and to the database, to get a snapshot of the actual data in the report. This is the default value. Enables you to limit the number of records used to gather data for previewing the report in live data mode. For example, if you set 250 as the record limit for the report, then 250 rows of data are gathered for the report results. The default value for the record limit is 500. Note: This option is only available if the Live Data option is selected. Selecting Use Prefix will take any FOCUS syntax in the input box and apply it to the components at preview time. For example, SQL SQLORA SET OPTIMIZATION OFF. Since the settings are saved for all documents, you can select the Use Prefix option to indicate to the tool whether or not to use the prefix for the specific document. Indicates how often (in seconds) to refresh the thumbnails.